I wrote a brief new blog post for Time Out Chicago about the Music Box‘s 70mm Film Festival, which returns next month for an “ultimate edition” (utilizing the new 41-foot screen and 7.1 channel surround sound installed for The Hateful Eight). The whole lineup is impressive but any excuse to urge folks to see Inherent Vice is a good one! You can read that piece here. This Saturday evening, January 30, at 8pm I will be introducing a screening of my film Cool Apocalypse at Transistor Chicago and participating in a post screening Q&A with my producer, Clare Kosinski, and select members of the cast. The screening is FREE and BYOB. Any of my students who attend the screening will receive extra credit towards their final grades (see your course website for more information). The below poster was designed especially for the occasion by Kendra Hutchings. Hope to see you there! The eighth episode of The White City Cinema Radio Hour is now online and consists of audio excerpts from Q&A sessions recorded at the 2nd annual Oakton Pop-Up Film Fest in Des Plaines, Illinois, in December 2015. In the first interview I talk to Brandy Burre, an actress best known for a recurring role on HBO’s The Wire, following a screening of Robert Greene’s extraordinary documentary Actress (for which she is the subject). Then I interview Chicago-based critic, filmmaker and pioneering video essayist Kevin B. Lee following a screening of Lee’s documentary short Transformers: The Premake. You can listen to both screenings on the Transistor site here. The seventh episode of the White City Cinema Radio Hour is the first of 2016 and is now online for your listening pleasure. I decided to mix things up by becoming an interview subject myself and having critic David J. Fowlie (Keeping It Reel) step into the interviewer’s chair. Fowlie interviews me about my feature film Cool Apocalypse (screening at Transistor on Saturday, January 30). Joining me as interview subject are Cool Apocalypse‘s producer Clare Kosinski and lead actress Chelsea David. Rounding out the program is a spirited debate between Fowlie and me concerning Quentin Tarantino’s controversial The Hateful Eight. You can listen to the episode in its entirety at the Transistor site here. Last summer I was fortunate to catch Jean-Paul Civeyrac’s My Friend Victoria at its single screening during the Music Box’s invaluable Chicago French Film Festival. I haven’t been able to stop thinking about it since and it ended up prominently featuring on my Top Films of 2015 list. Happily, My Friend Victoria has been picked up for distribution by Zeitgeist Films and is playing the Gene Siskel Film Center for a one-week run beginning tonight. 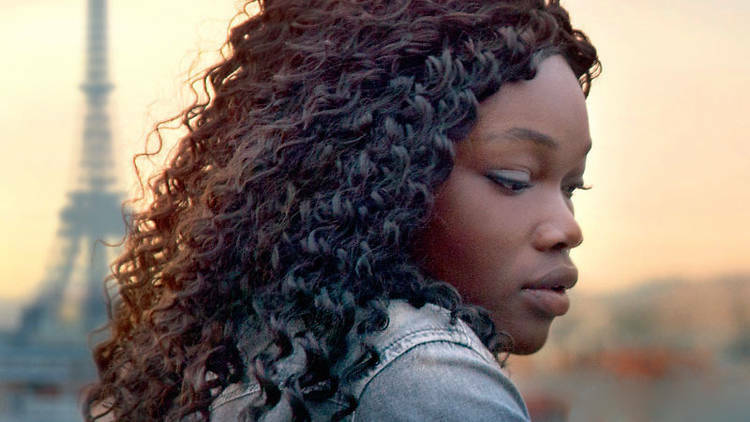 There are no big stars in the cast and Civeyrac is not a brand-name auteur outside of his native France but it would be a shame if this haunting and poignant drama about the life of a young black woman in modern-day Paris doesn’t find the stateside audience it deserves. You can read my review in Time Out here. Next Wednesday night I’ll be giving a talk about my book Flickering Empire with my co-author Adam Selzer at the Schaumburg Township District Library. (01/13) at 7pm. We’ll be showing clips from Chicago-shot movies from the silent era, including the brand new restoration of Charlie Chaplin’s His New Job in its entirety. Admission is free and open to the public but you must first register online. Hope to see you there!